TEKNO BUBBLES are patented, safe non-toxic blowing bubbles that look and act like normal bubbles under regular lighting, yet brilliantly glow under UV (blacklight) lighted conditions. Turn on a Blacklight, and Tekno Bubbles Glow Crazy! Tekno Bubbles are available in UV BLUE and GOLD. 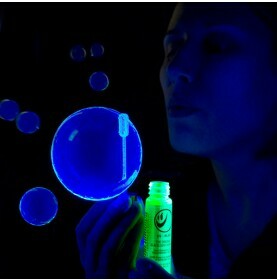 Blue TEKNO BUBBLES are patented, safe non-toxic blowing bubbles that look and act like normal bubbles under regular lighting, yet brilliantly glow under UV (blacklight) lighted conditions.